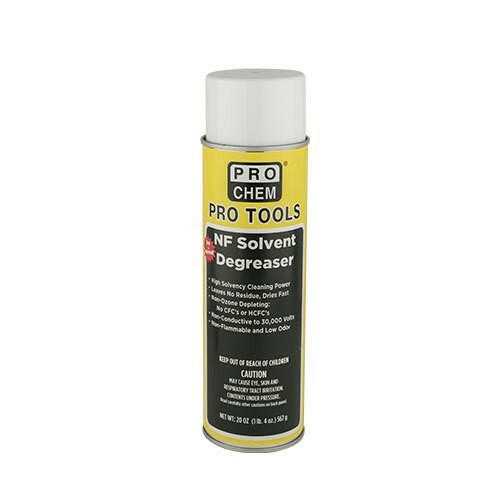 PRO TOOLS NF SOLVENT DEGREASER | Pro Chem, Inc. PRO TOOLS NF SOLVENT DEGREASER is a highly aggressive solvent blend that is ideal for the most demanding degreasing applications. Excellent for use on equipment and machinery while in operation. It has a high dielectric strength of 30,000 volts, and is potent enough to remove dust, dirt, oil and tar without leaving any residue. Remove cap and point actuator toward surface to be cleaned. Saturate to desired level. For the cleaning of confined areas and small exact spots, insert the plastic extension tube provided into the valve opening until it bottoms, then spray. Allow solvent to remain in contact for 30 seconds to 1 minute and then wipe or air dry. Repeat as necessary to achieve desired results. Extra heavy deposits may require brushing. Check to be sure the bristles are compatible with the solvent before use. Important: Prolonged contact with aluminum will cause discoloration. Always test in an inconspicuous area to check product for comparability. Not to be used for motorized vehicle maintenance or their parts.